It’s Sunday night of Labor Day weekend, but any barbecues died down hours ago, and the rural back roads of this southern Napa County neighborhood are a dark and silent maze. Around midnight, the lights of the Robert Sinskey Vineyards’ shop blink on. In the center of its gravel driveway, workers coax tractors to life and assemble large plastic bins that will soon brim with clusters of pale green pinot blanc grapes. Picked in the cool hours of the early morning, before their sugars can develop in the sunlight, the grapes will then be whisked off to the winery and prepared for fermentation. As 1 a.m. nears, a white van pulls up and a crew of about nine pickers, contracted by Rios Farming Co., clamber out to don neon-­colored vests and headlamps. They’ve traveled two hours from Stockton, California, to be here, and for the next 10 hours or so they will together pick 25 tons of fruit. Vineyard manager Debby Zygielbaum leads the group in a stretching circle despite her stiff work pants and then gives the call to start. In one swift motion, the workers lift small plastic bins onto their heads and begin running into the rows. They use clippers to quickly snip the grapes, 45 clusters per minute by my count, taking care not to crush the bulbous fruit or snag the leaves. Clipboard in hand, Sergio Agustin Sanchez, the crew’s stubble-faced supervisor, paces after them. Pickers emptying their bins yell out to be recorded, and the deluge of calls punctuates the din of the tractor. Sanchez must concentrate to hear every shout, but he’s grateful there are enough voices. A few weeks earlier, the labor contracting company he works for had to scramble to replace crews. Ten years ago, he reviewed 700 job applications for each season. Last year, he tells me, he saw maybe 15. “There aren’t any people now,” he says. In 1976, California’s vineyards shot to international prominence after two Napa Valley wines blew away blindfolded judges at a Parisian taste test. Since then, the amount of wine Americans drink has risen by 70 percent to three gallons per person annually; the United States now consumes more by volume than any other country, according to the Wine Institute. California generates $34 billion of the nation’s $60 billion domestic wine sales and nearly $115 billion annually in economic activity when you include employment and tax revenue. Napa and Sonoma counties produce most of the state’s high-end grapes in their combined 1,000 wineries. Like the rest of the state’s agriculture, the industry has long relied on immigrant workers for its heaviest labor. As of 2016, according to a federal survey, 9 out of 10 California farmworkers were born abroad, mostly in Mexico, and half were here without citizenship or legal work permits. But employers often have no way of knowing the immigration status of workers. Over the last few decades, millions of Mexicans have come north to work on US farms. But in the last few years, the migrations have slowed: The journey became more expensive and more dangerous, and the 2008 recession took hold. What’s more, during that time Mexico’s economy improved, and its rural poverty decreased. “This is a case where what’s good for Mexico creates big challenges for California farmers,” says University of California-­Davis professor J. Edward Taylor, who estimates that the number of farmworkers coming out of rural Mexico is declining by about 150,000, or roughly 1 percent, a year. On top of this, the foreign-born farmworkers who have settled in the states are aging out, and their children, as with American-­born farm kids, aren’t following them into the fields. 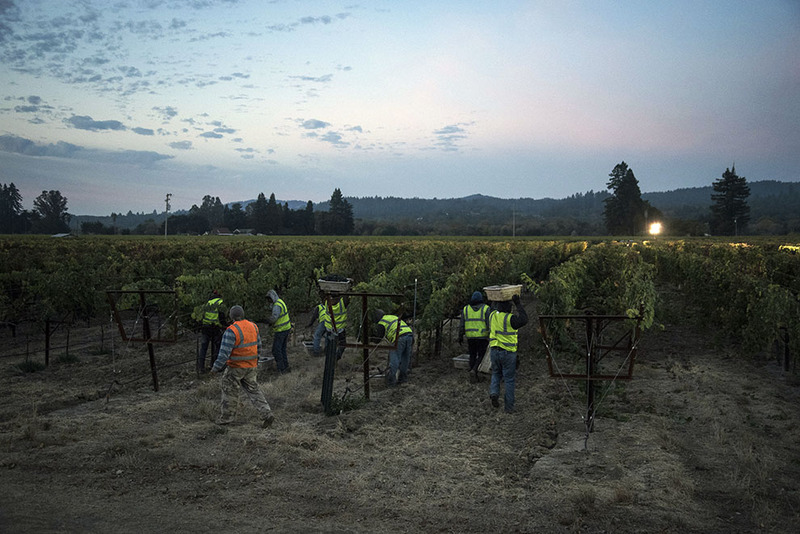 At a winery in Sonoma County, workers harvest grapes early in the morning. And advocates worry the new enforcement policies jeopardize the gains they’ve made for workers’ rights in farm country. At an April conference on immigration and California agriculture, Cynthia Rice, an attorney with California Rural Legal Assistance, reported that since the change in administration, her clients (who are all in this country legally) have gone to her not only with concerns about wage theft or inadequate housing, but also “with the fear that their cousin or their wife is subject to deportation if they come forward.” This approach to immigration enforcement “empowers the worst parts of our society,” she said. Couldn’t Rios just recruit American workers? Not likely, according to the economists I interviewed. Because of low wages and grueling conditions, vineyard jobs don’t attract people born in the United States. California growers boast their pay has gone up steadily for years—Napa has the highest average farmworker wages in the state. Yet economist Martin doubts farmers will ever pay enough to lure US-born workers into the fields. “I think there is some wage at which Americans would do some work, but suppose it’s $25 an hour,” he says. Before we hit that amount, he explains, robots or cheaper imports will swoop in. A mechanical harvester works by shaking a vine so fast the grapes fall off, leaving behind the rachis stem—the main axis of each cluster—and splitting some of the individual grapes. Kathleen Inman, who owns a small winery and an eight-acre vineyard in Sonoma’s Russian River Valley, prefers to use entire bunches during the fermentation process; she says the rachises “act like a cage to protect some of the berries” and lend flavor and texture. When a grape’s skin splits, “you’re losing the chance to have the fermentation happen inside the berry,” she explains. Grape pickers in Sonoma County pause in the middle of a busy harvest day. Over the next 12 years, Ulises got married and had three kids, and he found seasonal work in Napa’s vineyards that paid $6.50 more an hour than his factory gig. Even so, he had trouble affording the steep cost of housing near Napa—about $1,600 for a two-bedroom apartment—so he commuted four hours every day. He woke up at 2:30 a.m., downed a glass of milk, and slipped out of his house to pick up several of his co-workers. He steered his Honda onto the highway before sunlight could smudge the horizon and flicked on the radio, toggling between the Spanish news channel and any music loud enough to keep him awake. He worked six days a week. Yet he couldn’t save anything. Since then, Ulises has found a job at a wood factory closer to his home. Still, these days he thinks more and more of transplanting his family back to Durango. Because he can’t return to Mexico for a visit without fear of apprehension, he hasn’t seen his parents for more than a decade. Several friends are contemplating the same move. “We’re alone here,” he tells me, running his fingers over a stalk of grass, as if caught in a memory. 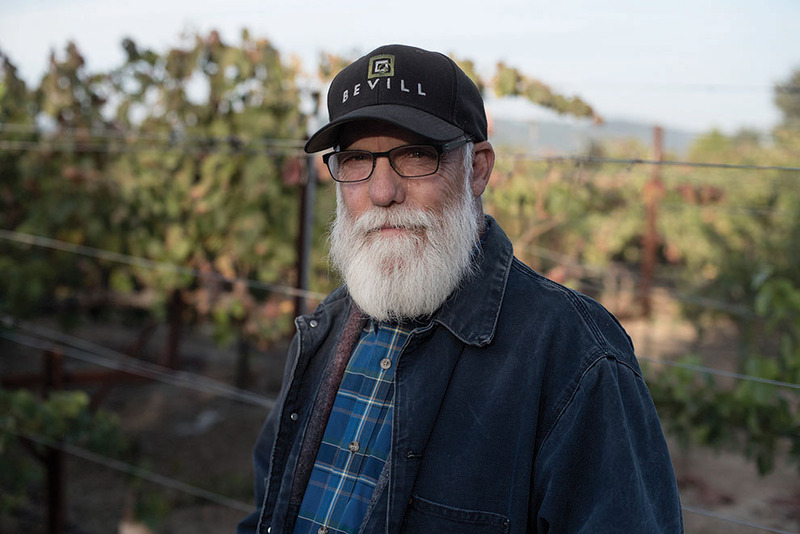 After struggling for five years to attract the field hands he once depended on, vineyard manager Duff Bevill decided to try something different: import them himself. He hired an attorney and applied for a Labor Department program called H-2A, allowing him to bring in workers from Mexico for up to one year. After a six-month application process, Bevill lined up a charter bus and went down to the American consulate in Tijuana to meet 24 new members of his crew. Most came from the same town in Jalisco state as one of his foremen, Armando Mesa. The program requires employers in California to cover transportation, pay visa holders more than the federal minimum wage, and provide them with federally approved housing. Bevill’s crew shacked up in a bunkhouse on the property of one of his clients near the airport in Santa Rosa. Vineyard manager Duff Bevill brings his pickers from Mexico with temporary visas. For their five-month stint, the men depended on Bevill’s company to travel around the area. Mesa picked them up on the weekends to run errands. He’d sometimes take them out for a meal, but most nights they cooked guisados (meat stews) in the dorm, where they weren’t permitted to drink alcohol. One weekend, Mesa drove some of them south to glimpse the Golden Gate Bridge. Bevill said he was happy with the first season with this crew, who “aren’t afraid to work,” and that all of them wanted to return. 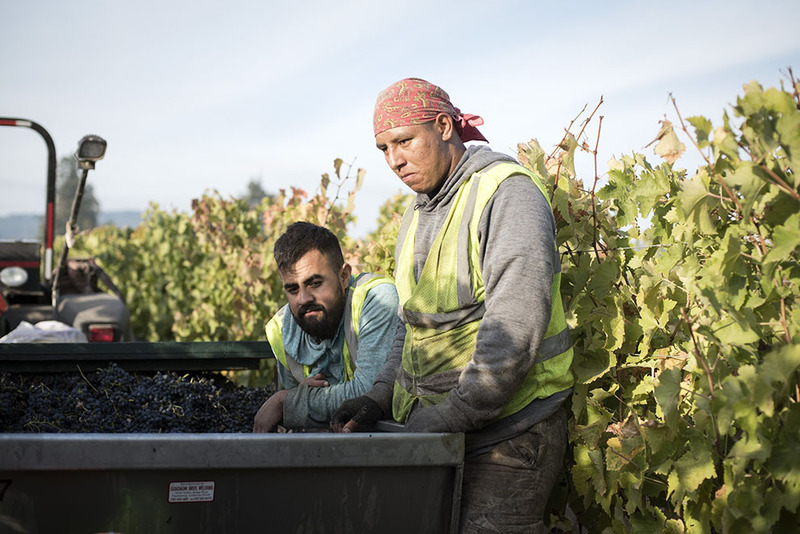 Since 2011, California has seen a steady rise in applications for H-2A visas, including a dramatic increase in applications for vineyard workers. Trump has signaled he supports more guest workers: His son Eric has regularly applied for H-2A holders to staff his Virginia winery. The House Judiciary Committee approved a bill in October that, if enacted, would make it easier for farmers to import this type of employee. The trend worries many farm labor advocates. “Guest workers are very much controlled by their employer and tend to be very productive because they are working in fear of being fired or deported,” argues Bruce Goldstein, the president of the nonprofit Farmworker Justice. The inability to bring their families further isolates these crews. “The people on our farms deserve the opportunity to be part of our social fabric,” Goldstein says. California Rural Legal Assis­tance’s Rice, who regularly reviews H-2A orders, notes that H-2A workers can be prohibited from receiving visitors: “How better to exclude a whole workforce population from the community that they live in than to not allow them to have visitors in their homes?” She adds that the program places an unfair burden on the towns housing the guest workers, because they can strain public services. “That’s not a social or economic model that rural communities in California can afford to invest in,” she argues. As Napa’s hectic harvest drew to a close last fall, disaster struck. On the evening of October 8, wind gusts upward of 60 mph stoked more than 100 wildfires, including the Atlas fire just east of the historic Silver­ado Trail. It burned up to the periphery of the Robert Sinskey winery, singeing vines and stopping short of a propane tank next to the back entrance. Another blaze ignited in Carneros, one mile from three other Sinskey plots. The fires leaped over highways, reducing barns to black shreds and destroying more than 6,400 homes, worsening the area’s housing crisis. This story was supported by the University of California-Berkeley 11th Hour Food and Farming Journalism Fellowship. *Debby Zygielbaum was killed on November 8, 2018, after a truck crossed into her lane and struck her car in a head-on collision.